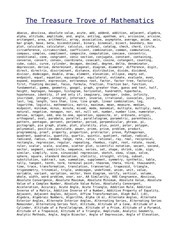 This PDF 1.4 document has been generated by Writer / OpenOffice 4.1.2, and has been sent on pdf-archive.com on 06/02/2019 at 18:41, from IP address 77.209.x.x. The current document download page has been viewed 52 times. File size: 1.7 MB (431 pages). CHRONO LOGICLY LOCATED DIRECTORY OF HIS ALL-SCRIPTURE. XIV. General reminder. The most important properties of the logarithms. XV. A mathematical auxiliary principle. XVI. The fundamental formula and measurement formula. XVII. Mathematical derivation of the dimension formula. between the sensation of warmth and cold. XIX. Reference passage of stimulus and sensation. XXI. Distributional relations of sensation. XXII. Distinction between sensory differences and contrast sensations. XXIV. The difference measure formula. XXV. Apply the difference measure formula to the estimate of the star sizes. XXVI. The higher difference measure formulas. XXVIII. 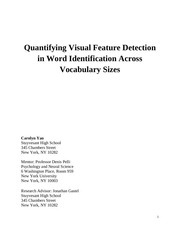 Remarks on the measurement methods of sensitivity. XXIX. Relationship between contrast sensations and sensation sums. XXXI. Generalization of the measure principle of sensation. b) General course of the investigation. c) Overview of terms used in the following. d) equations for the oscillations, which are based on below. e) Formulas and results that emerge from the study. f) Derivation of the formulas. Special investigations on some sensory areas. XXXIII. 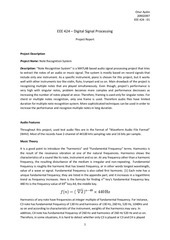 About sensations of light and sound in relation to each other. XXXIV. About extensive sensations in particular. 1. Addition. Derivation of the correction due to the finite m.
2nd addition. Derivation of the correction due to the size of the intervals. XXXVI. Transition from external to internal psychophysics. XXXVII. About the seat of the soul. a) Seat of the soul in a broader sense. b) Seat of the soul in the narrower sense. c) Question about simple or extended (closer) soul seats. d) Question about the extent of the extended seat of the soul. XLIII. Relationship between the sensory and mental phenomena. a) memories and afterimages in relation to each other. f) Some remarks about dreams. the world. 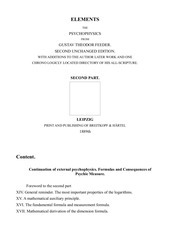 Points of contact of psychophysics to natural philosophy and religion. XLVI. Question about the nature of the psychophysical movement. a) Addition to an experiment proposed in the 30th chapter. b) Addition of some recent studies by Helmholtz into psychophysics. Foreword to the second part. sensation of light, of which I am in to remember the additions and really did. 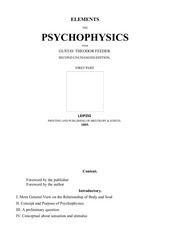 psychophysics in order to be covered by it. brevity and saving of references thereby obtained will not be insignificant. surrogate replaced by more direct representations that it has yet to represent. some recent important investigations by Helmholtz. Formulas and Consequences of Psychic Measure. attributed to these formulas, the following is to be remembered and remembered. to overlook the main conditions, they can be abstracted, as Th. IS 66 f. was asserted. be further discussed in the sequel opportunity. conditions may welcome a brief recapitulation of them. to obtain a given number is called the logarithm of that number. log comm. M = 0.6377843 - l.
value , the logarithm of + ¥ has a positive infinite value. values, the logarithm of fractions smaller than 1; negative values. log b and vice versa. transformed into log b + log b ' , the latter not. log (1 + a ) = a .
substituting 1 for M also applies to natural logarithms. few examples before his general dictum 1) . abscissa and the length of the curve for this small part. course of the great and the whole may deviate from the law of proportionality. parts of both quantities, as has already been asserted in the last explanatory examples. very small on both sides. information, but here the weaver The law comes in addition to the experience side. with a sharp mathematical expression. Zuwuchses. d b and d g are each a unit of their kind that is arbitrary to think related. p. 194 ff. P. 221 ff. Psych. Maßprinzipien, p. 162 ff. called the fundamental formula, by the derivation of all further formulas based on it. the threshold is shown in solidarity at the same time the correctness of the last. connection between the two formulas generally comprehensible as follows. another, rather than to the growth of sensation and stimulus. the value 1, if the logarithm of l is equal to zero. number, which, like these, can be regarded as summed up from successive increases. g = log b .
require a direct and strict for the preceding indirect and non-strict derivation. g = k (log b - log b ) (2). value of the stimulus b denotes where the sensation g begins and shrinks. is the modulus of the common logarithmic system in the meaning already given. called the fundamental stimulus value or fundamental value of the stimulus. application of the dimensional formula. threshold; and both must therefore flow out of it again. which contains the expression of the law in this form. stimulus-relations, it can be deduced quite fundamentally as follows. g - g ' = k log . only their ratio remains unchanged, which is the statement of Weber's law. implications of the measure formula, under the name of the difference formula. = log1 is, and log1 = 0.
be the consequences of our measure formula. elevation over the same by positive values . logarithm of a true fraction, however, is negative. immediately obvious meaningfulness. For now I do not want to stop it. absolute strength of the stimuli changes (Weber's Law). when it has risen so high that a given stimulus increase is no longer felt significantly. which do not reach the notability, briefly conscious and unconscious sensations. Hereafter, she should be regarded as well-founded. first the how-many-times of the last the sensation is given. large Value of g gives. stimulus the n -th root is pulled. that is, equal to the ratio of the logarithms of the fundamental stimuli. logarithms at 10 times, using natural at the etimes (2,718 .. .fold) the threshold. twelve twelve inches and under one foot. magnitude of the sensation. This will double when the stimulus rises to 2.718 times. g = log ß + 1 (9). di k = 1, because log a = 1. 1 = log 1 - log b . But since log 1 = 0, we get - log b = + 1.
of the dimensional formula g = k (log b - log b ), we obtain the above form. simplest form of the dimensional formula. stimulus extending over a given temporal or spatial extension, is always meant by it. can introduce a variable b and then follow the changes of g .
principal cases of their application. definition, which triggers a given sensation. thesame k in the Maßformel. differences will not change much in this deduction. Weber's law in the establishment of the measure formula. strength is to be produced increases or decreases in the same ratio. So if z. B.
then the n- times b must also be used. scale of sensation strengths at once. varying the constant b , whereby we remain at first in the following. generally be more convenient for deriving conclusions. relatively where its influence is to be neglected. reduction of b or increase of b .
account for the direct and instantaneous stimuli. condition when estimating the star sizes. it is easy to ask whether something and what has ever been won with it. no special measure is possible, but general conclusions are possible. psychophysics, but, as it were, the key to its door is. having established it so far in its field, despite all the disturbances. happens, the better we will work out the transition into internal psychophysics. to be regarded as resulting, as will be explained in more detail in the following. time t when the stimulus mv 2 in the time element dt grows by d × mv 2 . 1) The dimensions of the particles are not included in the elementary formulas. into the formulas, by doubling only the constants k and K at the end . this question, but which I will deal with only in the future. deceleration, has no influence on the sensation result. briefly indicate here in advance. g = K ( log b - log b ). threshold, therefore also refer only to sensory differences. if f is the general function character. stimulus, then only the latter form is possible. , and the function f could be taken arbitrarily. between g and g ', g ' and g &quot; . 1, third less than 1.
consciousness and unconsciousness of a sensation. but the magnitude of all unconscious sensations is simply zero denote. distance from the perceptibility or reality of sensation. connection with those of the unconscious. first be added in order to bring about the zero state only. the kind as valid. They just become valid, by giving them the right factual relation. above the threshold, ie, they are really felt. contradiction of the sensations themselves. to the presupposition of Weber's law. independent determination of the integral of integration. properly all general relationships which are to be represented. insensitivity in a certain temperature range would be expected. 1 = k log ( c '- T ) + C .
conception of a contrast of sensations, such as heat and cold, in general. of natural logarithms 2.718 .... are called. to the stimulus values which are smaller. infinite intervals of irritants from 1 to ¥ listened. Let us now follow the course of positive sensory values. the stimulus, but above a certain limit it rises more slowly. at the same time sinks absolutely and relative to the stimulus. ourselves led to the same result in another way. it, the sensation grows noticeably proportional to the stimulus. preferred meaning over any other system. of g and b .
the stimulus, it decreases more and more conspicuously. differences of the stimulus b .
positive sense as shown in the table. the threshold distance, hence fraction values; what makes log D negative and log D positive. coincides with the ratios of the associated sensations 0.6931 and 1.3863. The first, however, is easily derived from the Maßformel. case among infinitely many cases. coincide in a same maximum. This file has been shared by a user of PDF Archive. Document ID: 01907718.